Did you know that mainstream Paw Paw ointment is often made up of petroleum jelly (the by-product of petroleum)? I've put together a list of all the benefits and uses of natural Paw Paw cream for everyone making the switch to this multi-tasking ointment. Many of us think of Paw Paw ointment and automatically picture that little red tube that so many people use. When I found out that mainstream Paw Paw ointment is actually made more from petroleum jelly than fermented Paw Paw, I was shocked and annoyed. I think everyone remembers the moment they discovered this! 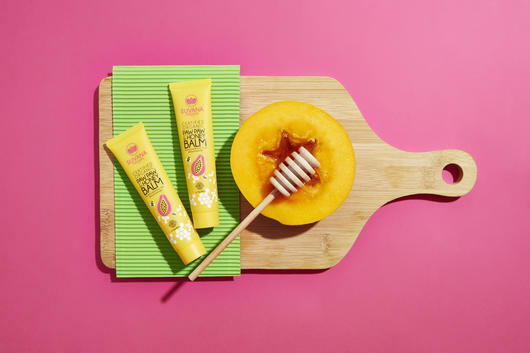 Now that there are so many natural Paw Paw products available, it's so easy to find an organic alternative that is packed full of beneficial ingredients and works for you. Paw Paw, also known as Papaya, is a nutrient-rich fruit that is packed full of vitamins, minerals and antioxidants. It is also calcium rich and includes high levels of potassium, magnesium and iron. Natural Paw Paw creams are completely petrochemical free and have a much higher concentration of Paw Paw in their formula. The main difference between regular and natural Paw Paw creams is the inclusion of petroleum jelly. Some of the most popular Paw Paw creams on our pharmacy shelves have a very large amount of petroleum jelly in their formulation. Petroleum jelly is a by-product of the oil industry and can contain petrolatum, mineral oil, liquid paraffin or paraffin oil. Petroleum jelly also creates a barrier on the skin, meaning that when you apply it to your lips can stop moisture from getting in or out and may also clog the pores on your skin. 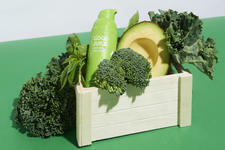 Find out more about switching your favourite products to natural alternatives here. How can you use natural Paw Paw cream? This is perhaps the most common use for Paw Paw cream because it works fantastic as a lip balm. If you use a natural Paw Paw cream that is petroleum jelly free, it will sink into your lips leaving them moisturised and soft. If you have a little one that suffers from nappy rash, then you can try using a Paw Paw cream or ointment. It can be used on minor rashes and it is suitable for the most sensitive of skin types. It’s a must have for any mum on the go and a great nappy bag essential. If you get dry patches of skin on areas like your elbows, knees or ankles then applying some Paw Paw cream may help soften these particularly rough skin areas. This is a must have product for me in the winter for just this reason! You can also try this magnesium cream with fermented Papaya. If you have any minor cuts, scratches or wind burns then applying Paw Paw ointment to these areas can provide soothing relief. The delicious smelling Suvana Certified Organic Paw Paw cream is made with Paw Paw and Honey for a rich and rejuvenating topical ointment. 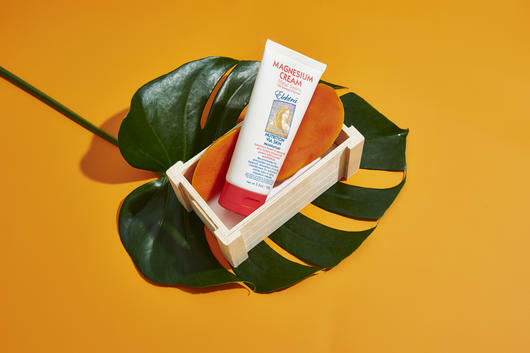 This cream is a fabulous alternative to regular Paw Paw creams that are packed with petrochemicals, and has a very long list of uses for everything from soothing blisters, taming eyebrows, hydrating chapped lips and smoothing dry cuticles. It is 100% natural and made with organic coconut oil, vitamin E and other superfood ingredients. The enzymes in the Paw Paw are known for soothing topical skin inflammation and minor burns. One of my favourite ways to use Paw Paw cream however, is to layer it over my favourite natural lipstick to enhance the shine. The Suvana Paw Paw balm is also available in a Beeswax and Honey-free vegan version, containing Coconut Oil, Cocoa Butter and Jojoba Oil for nourishing hydration! 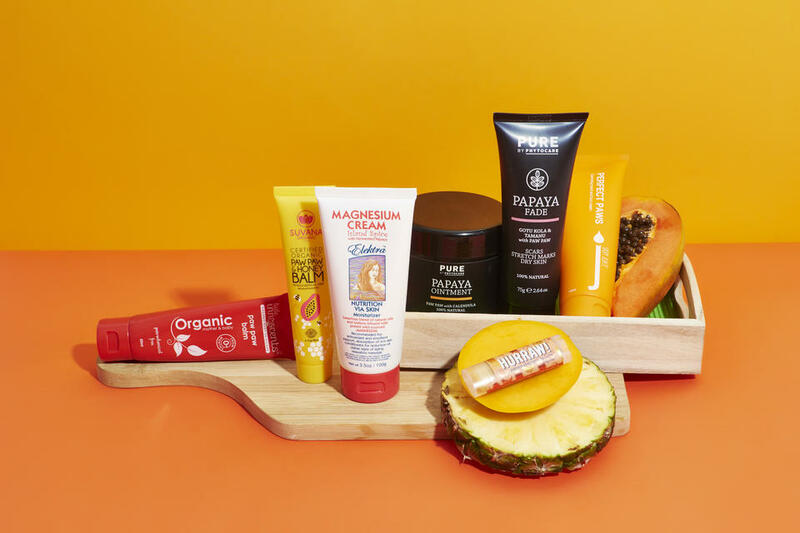 With a delicious, fresh tropical scent, the Hurraw Papaya Pineapple Lip Balm contains a base of cold pressed Papaya Seed Oil and Coconut Oil for rich hydration, while natural Pineapple extracts provide fruity flavour reminiscent of a summer holiday! Rich in essential fatty acids, Papaya Seed Oil deeply moisturises lips while helping to soothe inflammation. The PURE by Phytocare Papaya Ointment contains nourishing Shea Butter and Macadamia Oil as well as soothing Calendula to moisturise dry, cracked skin and provide a protective surface barrier. 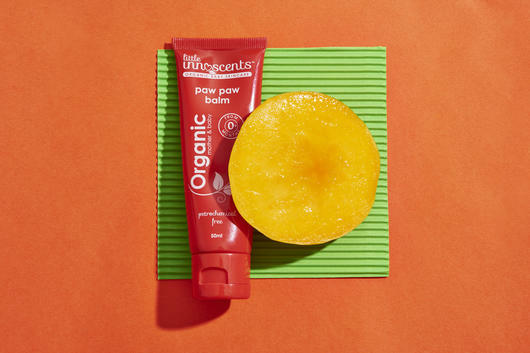 This beautiful rich balm can be used on inflamed, irritated or reddened skin, providing soothing relief as well as a beneficial hydration barrier which can help assist in the skin's natural healing process. Also available in a larger Tub size, this hydrating ointment is great to keep on hand for sore and chapped lips or nappy rash, and can even be used as a dewy, glowing highlighter! Perfect for kids and mums alike, the Little Innoscents Organic Paw Paw Balm contains Sunflower Seed Oil and Shea Butter as well as Cherry Coconut Extract for a soothing and enriching moisture balm that is safe for delicate young skin and breastfeeding mums. This Petroleum free balm may be used on newborn babies and children on dry, damaged or irritated skin.